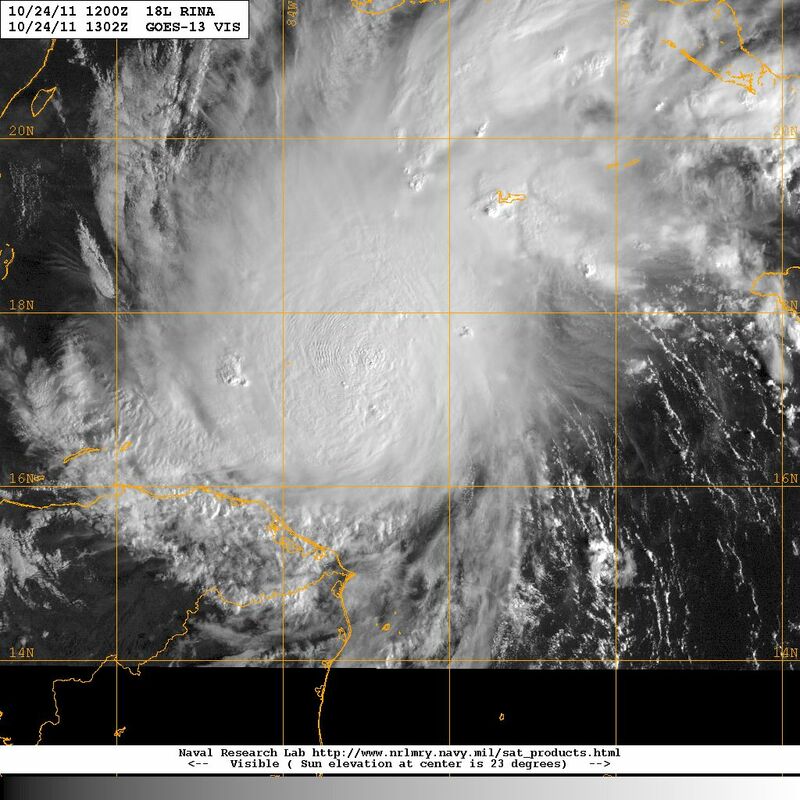 2011 Atlantic Hurricane Season: Was that it? Although the historical record shows there have been Atlantic Basin tropical cyclones in every month of the year the “official” Atlantic Hurricane Season runs from June 1 through November 30. So, today being Saturday 3 December 2011, we could say that “officially” at least the 2011 Atlantic Hurricane Season is over. The question is: does mother Nature agree? Looking at various satellite images from around the world, but well aware of the caveat that nature is quite capable of surprising us and that change is a constant of nature, there is an absence of the triggers and contributors in the regions that usually lead to cyclogenesis in the Atlantic basin. On that basis I would say the 2011 Atlantic hurricane season does appear to have come to an end. There are no tropical waves or cells of disturbed stormy weather over the region of Equatorial Africa designated as the tropical-wave assembly line. Nor do we see any seeds for potential tropical cyclone development along hurricane alley, the Atlantic Ocean corridor reaching from the western coast of Africa near the Cape Verde Islands to the Lesser Antilles and the eastern Caribbean. A very large bubble of high atmospheric pressure and dry air has prevailed over the Gulf of Mexico and most of the Caribbean sub-basins, as well as along most of the USA Atlantic seaboard and adjacent Atlantic coastal waters., which has prevented any sort of tropical weather from developing or penetrating the region. The composite global mosaic of satellite images shows a large swath of the northern tropics from the eastern Pacific to the northern Indian Ocean that on 3 December 2011 was basically clear of any disturbed weather, or tropical waves. Likewise a full-disk composite satellite image of Earth’s Western Hemisphere shows a disrupted belt of tropical activity from the coast of western Africa, north of the equator, pretty much all the way to Hawaii except for some stormy weather over the Andes and other mountains in northern South America. 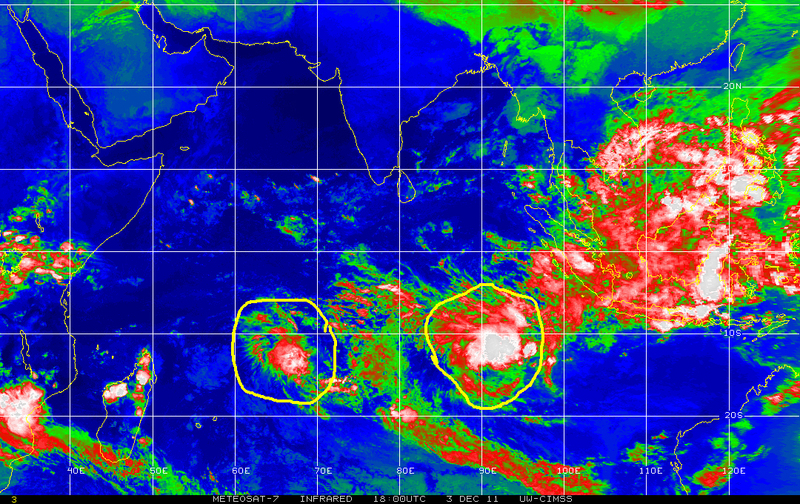 In fact the only potential for tropical cyclonic activity worldwide is in the southern Indian Ocean where two tropical waves, one south of the Indian subcontinent and the other to the northeast of Madagascar, are showing some organization and plenty of stormy weather over warm waters that may lead to future tropical cyclone generation. Other than these specific cells all remains quite on the tropical front. What kind of a season was it in 2011 in the Atlantic basin? With a total of 18 named storms the season qualifies as quite an active season, certainly a continuation of the multidecadal period of increased activity that started in 1995. However only 6 storms reached hurricane strength and of these, only 3 became major hurricanes [ category 3 or higher in the Saffir-Simpson scale] and in this sense it was a below-average season. But if we assess the death toll, injury and damage caused by land-falling storms or hurricanes that otherwise affected land, the 2011 Atlantic season clearly ranks way above average based on a death toll that included at least eleven in New Jersey and six in Vermont, more than $7.0 billion in damages and the worst flooding seen in the USA Northeast in more than 80 years. The negative consequences of the 2011 Atlantic hurricane season were made even worse when tropical storm Lee followed in hurricane Irene’s footsteps contributing additional intense rain from Virginia to Vermont where already saturated soils could not keep up with the pace of precipitation exacerbating flood conditions throughout the region. The above reinforces the point that it only takes one impact by a tropical cyclone to cause plenty of damage and human suffering. Also, in terms of damage, it does not have to be “the big one” meaning a monstrous category 5 with extreme winds pounding a region; a lot of damage can be caused by what could be classified as a minor hurricane, but one that carries a lot of water in it as was the case with Irene. If we assess the 2011 Atlantic hurricane season in the context of tropical cyclone activity on a worldwide basis so far in 2011, it is interesting to note that we are seeing a repeat of what happened in 2010 when the total number of named storms worldwide was close to 17% below average. So far in 2011 there have been a total of 65 named tropical cyclones worldwide, including the 18 that generated over the Atlantic. With only a few days left before the end of the year and little potential for cyclogenesis in the near future, based on current atmospheric conditions worldwide, it appears we will end the year with another below-average global season. While two consecutive years of below-average tropical cyclone activity on a global basis do not signify a trend one can not, but ask if this might not be a signal from Nature telling us that the threshold for cyclogenesis has shifted to a higher level, in response to global warming? In my opinion the multidecadal cycle of increased cyclogenesis in the Atlantic is masking this possible shift in the threshold for tropical cyclone generation in this basin, while elsewhere in the world we continue to see fewer storms. Certainly food for thought and an important area for research exists relative to tropical cyclone activity on a global basis, and how this is being affected by global warming or others aspects of global climate change. Relative to this topic it is critical to keep in mind that what really matters is our own relative vulnerability to tropical cyclones in the community where each of us lives, because it is the impact at the local level that can bring death, injury, damage and human suffering, regardless of whats happens during a season in a given basin or of what may be happening on a global basis in response to global warming. All it takes is one impact. We must pay attention, be prepared, and above all we must practice mitigation! Historically in the late Fall, say late mid-October through mid-November, more often than not the annual Atlantic hurricane season appears to shift most activity to the Caribbean sub-basin. True to form, and after trying for three weeks in a row, by generating three low-pressure systems that were characterized by the vast amount of rain generated, the Caribbean saw yet one more low pressure system that reached tropical storm strength on 23 October and barely 24 hours later is now category 1 Hurricane RINA. When RINA was still a tropical storm, early forecasts projected slow and gradual strengthening with the cyclone reaching hurricane strength possibly by late Thursday 27 October or Friday 28 October. This forecast was based, among other criteria, on the generally quite dry atmospheric environment throughout most of the Caribbean, and the also quite dry environment and a ridge of high pressure dominating the Gulf of Mexico ahead of most of the projected cyclone tracks. 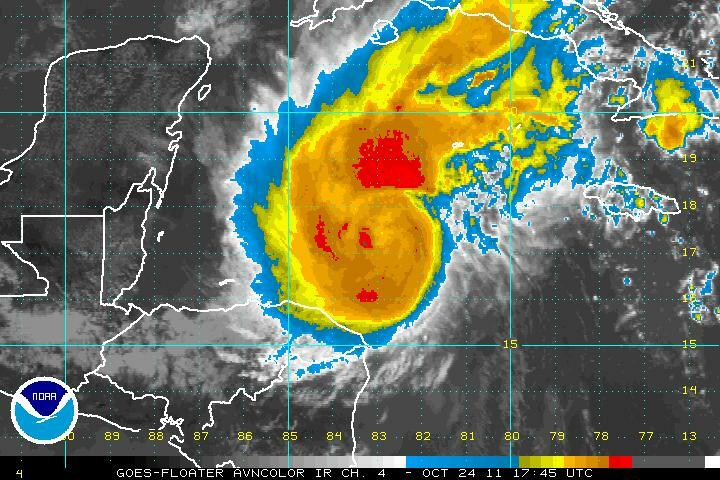 As it happens, as if to illustrate the uncertainty associated with predicting the intensity of tropical cyclones, RINA has already reached category 1 hurricane strength on Monday 24 October 2011 and appears primed for further strengthening. Such rapid strengthening has now contributed to a modified forecast that has Hurricane RINA reaching category 3 strength within the next 48-60 hours with maximum sustained winds of 200 kph, and higher gusts, while moving toward the coastline of Mexico in the state of Quintana Roo. On Sunday 23 October 2011 the consensus track had tropical cyclone RINA moving in the general direction of Belize City and Chetumal Bay, in Quintana Roo, Mexico, but new data and aircraft observations now have Hurricane RINA on Monday 24 October 2011 still moving northwestward, but anticipated to make a gradual turn toward the north by northwest or even northward pointing it toward the northeastern region of the Yucatan Peninsula in the vicinity of Tulum, Playa del Carmen, Cozumel and Cancun in Quintana Roo, Mexico. The projected track for Hurricane RINA carries quite a bit of uncertainty although it is based on a consensus of the various forecast models used by the Tropical Prediction Center, National Hurricane Center of NOAA. 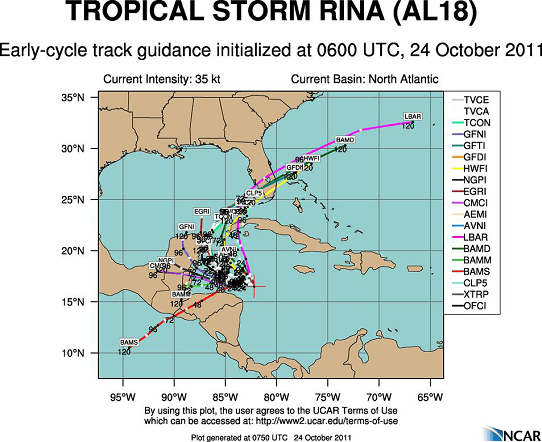 Typically, most of the models appear in agreement regarding RINA’s track over the next 24-36 hours, but beyond that they start to diverge widely with some models taking RINA west across Central America, others moving it into the Gulf of Mexico and yet others have RINA impacting South Florida. The image that follows shows such widely diverging results from the various models, and illustrates the difficulties faced by NOAA forecasters as they try to keep emergency managers and the general public as well informed as possible so that they may take precautionary measures in order to reduce the potential for damage and protect life and property ahead of a possible impact by the approaching cyclone. Relative to the forecast track, with all of its associated uncertainty, it is important to note that even with the rapid intensification experienced by RINA, the preferred track remains as shown above for what is now Hurricane RINA. 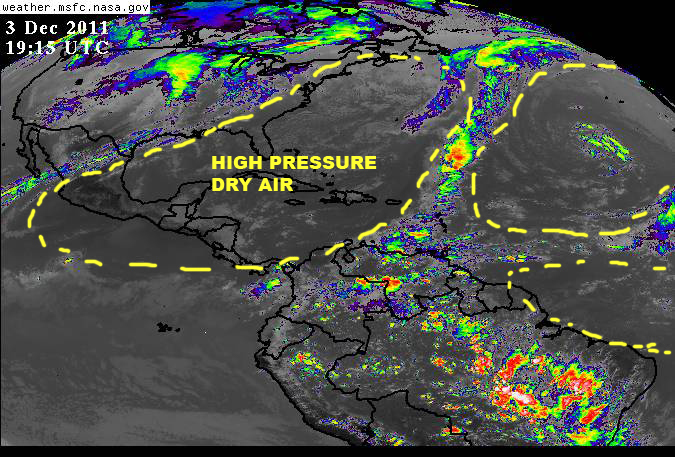 The satellite image above by showing water vapor in the atmosphere emphasizes the very dry atmospheric environment dominating most of the Caribbean and Gulf sub-basins as well as the open Atlantic. The solid-yellow outlines identifies Hurricane RINA to the north of the Nicaragua-Honduras border as the system moves generally west by northwest. Also visible is the ridge of high pressure cutting across the Gulf of Mexico and South Florida, which is expected to influence the track that RINA will follow toward the end of this week. Over the far eastern Caribbean the dashed outline identifies a system of disturbed weather that developed over ‘Hurricane Alley’ and is now to the west of the Lesser Antilles moving toward Central America and Belize. Two other for now minor weather systems continue to move along “Hurricane Alley’ and may penetrate into the Caribbean over the next few days. 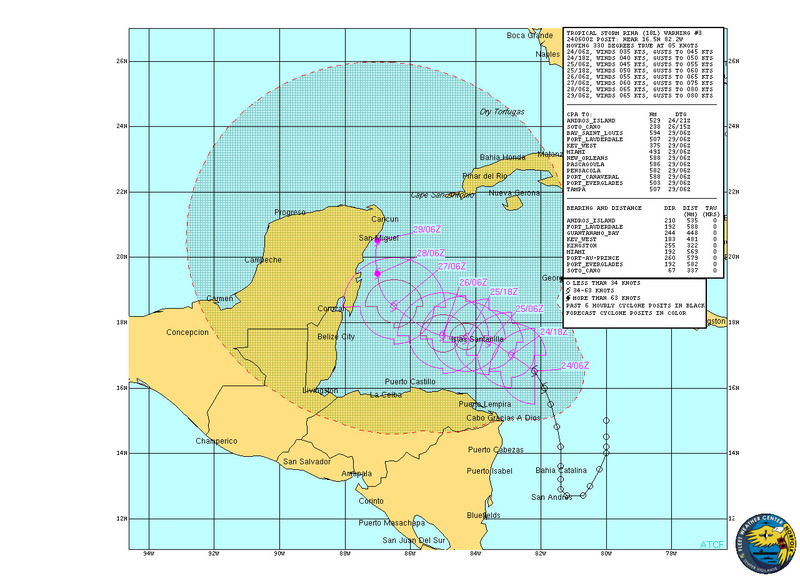 In summary, on Monday 24 October 2011 we have the 17th-named tropical cyclone and 6th hurricane of the 2011 Atlantic hurricane season, also the expected activity in the Caribbean and the potential for continued activity if the sub-basin as the annual season enters its late phase. All interest around the Caribbean sub-basin, Florida, the Bahamas and in the Gulf need to monitor Hurricane RINA closely as well as the system now over the eastern Caribbean over the next few days to bar any surprises over the late phase of the 2011 Atlantic Hurricane Season.